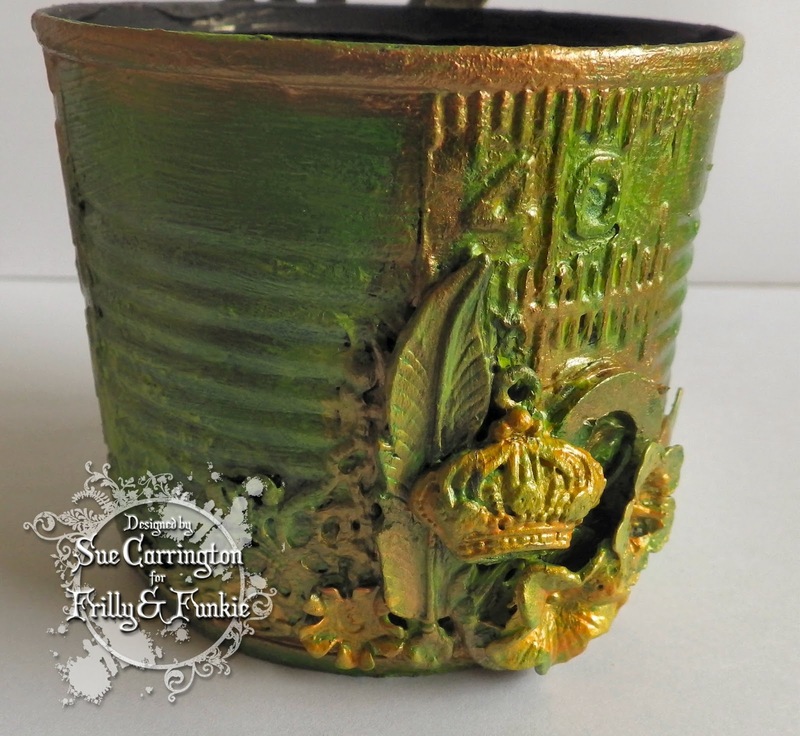 Stamping Sue Style: We're going green at Frilly and Funkie ! As usual I was racking my brains with what to do when I spotted a small baked bean can that was destined for the bin and the light bulb came on ! 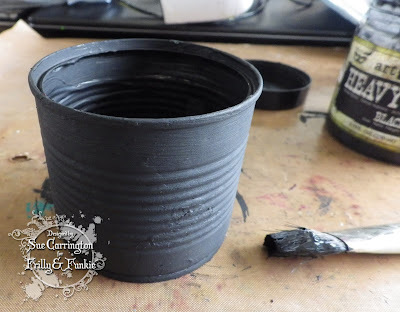 I washed out the can thoroughly then gave it a couple of coats of thick black Gesso. I then got so carried away with the process that I didn't take an in between photo ! So I'll try to explain with close up shots. 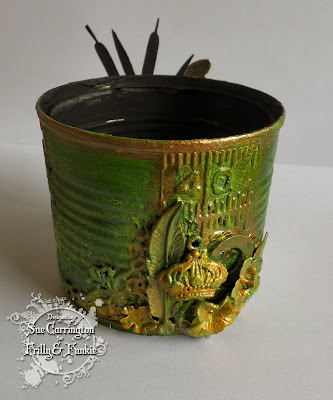 I had some left over pieces of embossed metal which were glued at intervals around the can. I arranged some embellishments and glued them into position, went off to mow the lawn and when I came back they'd set enough for me to paint them with black Gesso too. I then painted over the the whole can with Lime Peel Art Alchemy acrylic paint. I blended some Green Olive over this then highlighted the metal embellishments with Gold Rush, Fresh Orange and Brass Hardware. You can see on the above photo how the colours layer up so well due to their translucency. 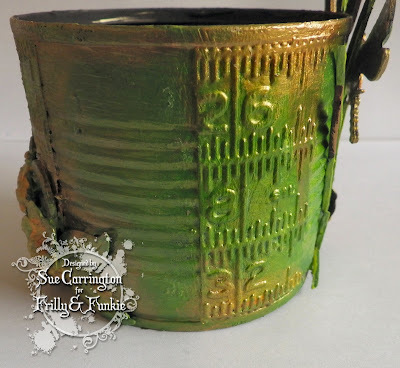 On the opposite side of the can I used one of the Southern Ridge Trading Company pieces which was painted with the Art Alchemy paints. As the paint softened the piece a little I could bend it to the shape of the can. 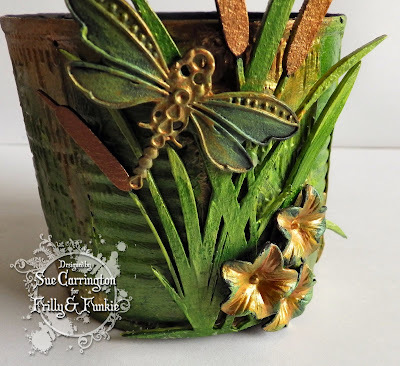 The three little flowers were painted with black Gesso then with Art Alchemy paints as was the dragonfly. I used Gold Rush to highlight areas around the can and around the rim. I think I can honestly say that I've had my money's worth from this tin of beans ! I hope you are able to find something that you can give a new life to and do make sure you hop over to the Frilly and Funkie blog and check out the rest of the DT's fabulous projects. Sue I just love the translucency of the paint it makes the green, gold and hints of orange blend and highlight beautifully! Fabulous re-cycled can! Gorgeous! I would never in a million years guess that this is a baked bean can! It looks for all the world like a pottery piece that you'd purchase in a botanical gift shop. The colors are jewel like, and that dragonfly is the perfect accent. It's magnificent!!!! A fantastic up cycle Sue.........an amazing tin to store crafty bits n pieces in or to place a small pot of herbs in. Wow, sue, I am totally in gaga mode over your baked bean tin transformation! If I didn't know any better, I'd swear this came from our most expensive garden store in town! 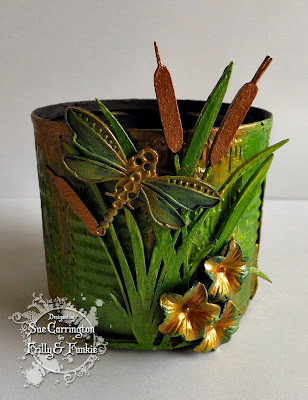 the ridges of the can brilliantly compliment that fabulous scene you have created with the ruler, the metal bits, the cattails and dragonfly. And your colors are oh, so yummy! Where can I purchase one of these???? LOVE! Hugs! Oh, oh, oh - fabulous! Nuff said!